Since being appointed in November as Diane Greene's successor as the CEO of Google Cloud, Thomas Kurian has kept a low public profile, doing little press and embarking on a broad listening brief across a business he believes can compete with the market leader Amazon Web Services (AWS). Google Cloud's flagship Next conference in San Francisco was many people's first chance to get a read on who many internally already refer to as TK. Was he going to reflect the hard-nosed values of his long-time employer Oracle, or was Kurian cut from a different cloth? Dressed in a steel blue suit and open collared white shirt, it was a low-key keynote performance from Kurian on day one, where he was introduced by Google CEO Sundar Pichai. He started by thanking Diane Green for her service to the company before her recent retirement, and moved on to talk about the big day one announcement of Anthos, a platform that allows customers to run applications on-premise, in the Google Cloud and, crucially, with other major public cloud providers like Microsoft Azure and AWS. The rest of the keynote leant heavily on his colleagues and partners - many of whom talked about having worked with Kurian before during his time at Oracle - showing his status as a Silicon Valley insider, while also signalling a Satya Nadella-like commitment to openness which will be a positive sign for anyone looking for remnants of an aggressive Oracle-style approach to enterprise sales. "Our goal has always been simple: you have to have the best technology and the easiest to adopt solutions that give customers choice. If you do, they will choose you, if you don't, eventually they will be unhappy," he told Computerworld UK during a press roundtable this week. On stage the closest he got to taking shots at the competition was in his assessment of Google's open source strategy. "Google has a long history of developing technology and making it available in open source to foster innovation," he said. "Recently the open source community has found cloud providers are not partnering with them, but attempting to take away their ability to monetise open source. "We as Google do not believe that is good for customers, the developer community or for software innovation." This was the precursor to announcing the "first integrated open source ecosystem", which allows customers to use technology from open source specialists like DataStax or MongoDB using their Google Cloud credits, with a single console for management and integrated billing from Google. 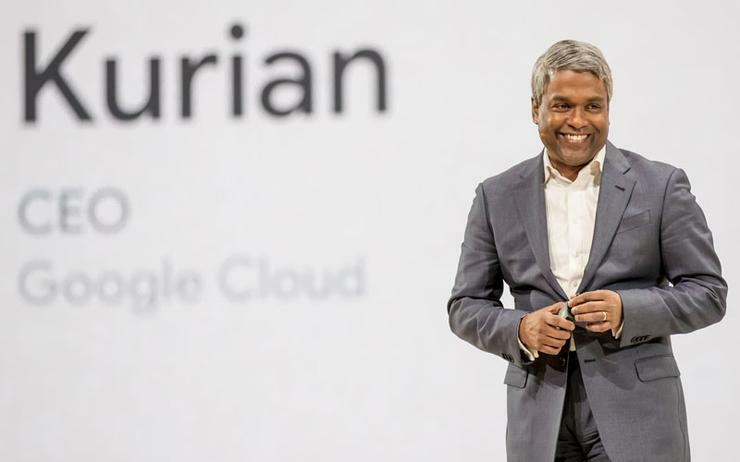 It's somewhat unfortunate, but possibly unavoidable, that Kurian has adopted the buzzword de jour of 'digital transformation' in setting out his overall vision for Google Cloud. "We have a clear vision of what we want to offer customers in a number of industries who are going through digital transformation," he said on stage. "We want to give them global scale, distributed, secure infrastructure; a digital transformation platform that that helps people build innovative digital transformation solutions, and then, industry specific-capability for digital transformation in a number of industries." Taking the digital transformation platform alone, Kurian broke this down further into five elements. "The ability to manage data at scale; build and modernise application workloads; do analysis and make better business decisions; use Google's AI and ML technology advances and collaborate with others in your organisation or outside the boundaries of your organisation in profound new ways." On the industry-specific solutions Kurian is focusing his attention of the healthcare, financial services, retail and media verticals to start with. "We're building extremely deep domain-specific solutions for each industry," he said. Details as to what these vertical-specify solutions would actually look like isn't yet clear however. Speaking to the press, Google Cloud vice president for EMEA, Sebastien Marotte, said that Diane Greene built the foundation for Google Cloud to be an enterprise-ready cloud vendor, and now Kurian "is going to help us accelerate our penetration of the enterprise base across the industries he mentioned today... So it is rallying and aligning the whole company, actually." The assumption is that Kurian will shift the go-to-market strategy of Google Cloud from targeting developers (bottom up) to targeting the C level technology buyers (top down). It is expected that this will translate to a significant growth of Google's go-to-market functions. In one of few interviews he has done since joining the vendor Kurian told the Wall Street Journal that Google's cloud sales team is around one-tenth to one-fifteenth the size of the sales forces at AWS and Microsoft Azure. Speaking on the topic with the press this week he said: "The two things customers tell us is: we love your technology, but we don't have enough people from Google to assist us with your understanding of the technology and your understanding of our industry. "So that essentially translates to growing our go-to-market function and our work with partners to deliver the right solutions for customers, which means adding people in sales and customer service and customer engineering, which is our technical teams, as well as hiring people with deep industry backgrounds." He wouldn't be drawn on how this might translate to actual hiring figures however. "When we compete with other players, we win far more of the time than they do. But we are smaller in size. Many people have asked me, they say: 'Thomas is focused on growing sales', it is not growing sales, it is growing all of our customer-facing functions," he added. Simplified pricing, licensing, co-innovation frameworks and extended partner reach are other elements of Google Cloud's new go-to-market strategy under Kurian. First impressions of Kurian show an understated, even humble leadership style, with a clear vision for the company and where its strengths lie. His quiet demeanour and gentle sense of humour almost certainly hide a steeliness however, and his aggressive desire to hire more sales and customer success staff shows a clear desire to compete and shake off Google Cloud's moniker as the third-placed player in this market. There is none of the typical tech CEO grandstanding or propensity to throw lightly-veiled barbs at competitors at this stage from Kurian though. Nick McQuire, vice president of enterprise research at CCS Insight commented on day one of the conference that "this is a critical moment in Google Cloud’s history and pressure on it to show enterprise momentum this year has never been higher. "With a new CEO and the cloud wars against AWS and Microsoft intensifying, Google remains a third place player," he added. "But it kicked off Next, which has tripled in size in two years, with some impressive announcements showing the world that open source, hybrid multi-cloud and industry verticals are now core aspects of its differentiation. "Above all, a new Google Cloud is emerging under Kurian that is much more customer, sales and partner-led but it must make investments in these areas quickly if it is to put a meaningful dent in AWS and Microsoft over the next 12 months."